an implementation of cradle to cradle design in earthbag construction. Africa continually faces significant challenges such as globalization, unfavorable terms of trade, increasing debt burdens, declining agricultural production, political instability and civil strife, all of which have implications for sustainable development (1). Due to these challenges, as well as exhausted soils, lack of market for agricultural products and shortage of capital, African agricultural income has greatly declined. As farmers attempt to escape the poverty caused by decreased farming yields, they flock to the cities in search of income-earning opportunities. Although these cities are currently the centers of economic activity, urban poverty and homelessness are negative by-products of economic attraction and the resultant urbanization. In this study, one step towards sustainability for Africa is addressed, the need for appropriate housing . The housing is relief housing that aids in resolving one of the urban issues, sheltering Internally Displaced People (IDPs). These people have been forced to flee their homes to escape armed conflict, generalized violence and human rights abuses (2). Ethiopia , a country with about 150,000-265,000 IDPs in 2005 (3), was selected as the African nation for the relief housing design . The design of this relief housing addresses current environmental, economic and social issues in Ethiopia to benefit people, prosperity and planet in a sustainable way. The environmental impacts of urbanization include the health consequences of crowding and increased exposure to concentrated waste, unsustainable resource consumption and greater settlement on environmentally fragile lands (4). When designing sustainable housing for Ethiopia , it is necessary to look beyond traditional construction materials and methods to avoid repeating errors in urban development. Poverty, both human and environmental, does not allow for the unsustainable use of many manufactured materials, thus natural building techniques become necessary. This type of construction results in monolithic architecture: Allowing an entire structure to be built, from foundation and walls to roof, using the same materials throughout (6). The purpose of this project is to implement the cradle to cradle design protocol in earthbag construction to design a sustainable relief housing prototype that is both comfortable and eco-effective for the Ethiopian people. Sustainability issues in Ethiopia : According to the 2005 World Summit Outcome Document (8), the interdependent and mutually reinforcing pillars of sustainable development are economic development, social development and environmental protection. The relief housing prototype design and development considers all three pillars of sustainable development in Ethiopia . Current sustainability issues in Ethiopia on people (social development), prosperity (economic development) and the plant (environment) are studied. Population, climate, geography and culture (people): As of July, 2006, Ethiopia 's population was estimated to be over 74,000,000, ranking the country 18th worldwide in number of inhabitants (9). Population growth is responsible not only for Ethiopia 's social and economic situation, but also for the widespread environmental degradation the country is facing (10). Ethiopia 's climate varies widely due to elevation, terrain and wind, as illustrated by the presence of three climate zones within the nation (9), (11). Population throughout Ethiopia is dependent upon climate and environment for food and income generating opportunities (12), (13). Table 1 shows the geographic, climate zones and population distribution in Ethiopia . According to Commission for Africa (14), cultures of developing nations such as Ethiopia are too easily brushed aside in the rush to offer pre-packaged solutions from the developed world. Therefore, the culture of the Ethiopian people plays a large role in achieving sustainability throughout the nation. Culture encompasses many factors, including the relationships between people and their ideas, personal respect, socialization, morals, values and security, as well as how these factors are transmitted from one generation to the next (14). Ethiopia is home to a wide variety of cultural groups, each affecting the other in some way; therefore, culture throughout the nation is an enormously complex concept (15). Statistically, the Oromo culture is most dominant throughout Ethiopia , accounting for approximately 40% of the country's population, while the Amhara and Tigre (9) combine for approximately 30%. Similarities as well as differences between cultural groups are common. Economy, poverty and urbanization (prosperity): Ethiopia 's economy is based on agriculture, accounting for half of GDP ($62.88 billion in purchasing power parity), 60% of exports and 80% of total employment (9). During the 1980's, Ethiopia was considered a potentially wealthy country due to abundant agricultural production and the presence of valuable minerals. However, agricultural expansion, income generating opportunities and national food security have been undermined by multiple factors including massive land degradation, increasing population pressure and unforeseen weather conditions (12), (13), (16). Currently, Ethiopia is one the world's poorest nations, with an estimated annual per capita income of $100 US dollars (12). Fifty percent of the Ethiopian people live below the poverty line, surviving on less than one US dollar per day (9), (14), (17). As a consequence of poverty created by reduced agricultural production, many Ethiopian citizens are forced to flee their rural homes, settling in the slums of already overcrowded cities (14). Though urbanization is not yet a major problem in Ethiopia , the rate of population growth in urban areas is much higher than in rural areas. Ethiopia 's urban centers, Debre Zeit, Nazret and particularly the capital city of Addis Ababa, are growing at an unprecedented rate (10). Environmental degradation (The Planet): The combination of the above factors-population, climate, economy, urbanization and poverty-has resulted in degradation of the Ethiopian environment. Current environmental concerns throughout Ethiopia include deforestation, desertification, overgrazing, soil erosion, depletion of the water table and loss of biodiversity (9). Population, deforestation and erosion are part of a vicious cycle. As the population grows and people over-cultivate scarce land, Ethiopia 's nutrient value is reduced and erosion occurs (10). Because Ethiopia inhabitants are totally dependent upon forest wood for construction and fuel, deforestation is at an extremely high rate of 150,000-200,000 hectares per year. Unless drastic measures are taken to reverse the trend, Ethiopia will be completely deforested in less than 20 years (10), (18). The relief housing is designed using a domed structure, which is common in earthbag housing and mimics traditional Ethiopian tukul. All of the three tenets of cradle to cradle model are implemented in earthbag housing design to build a sustainable house that can benefit Ethiopian people, prosperity and the planet. Based on environmental and human health, all materials selected for construction are naturally available and can safely return to nature after use (waste equals food). Structural design maximizes natural energy use (use current solar energy). Housing and interior design considers the local culture in Ethiopia (celebrate diversity). Design decisions for the sustainable housing were made using a process known as evidence based design in which design decisions are supported by scholarly research or existing precedent (19). To evaluate the durability of housing exterior under conditions of intensive sunlight exposure, the Atlas SUNTEST Xenon Exposure System, which simulated sunlight, was used. The initial and lifecycle material costs of the relief housing were also evaluated. Selection of construction materials (waste = food): In cradle to cradle design protocol, every part of a product would be either a biological or technical nutrient so that every discarded product will provide nourishment for something new. McDonough and Braungart conceived biological nutrients as those that will easily reenter the water or soil without depositing synthetic materials and toxins. They also proposed technical nutrients that will continuously circulate as pure and valuable materials within closed-loop industrial cycles, rather than being down cycled into lower-grade materials (20). Considering current economic and environmental situations in Ethiopia , where relatively lower amounts of synthetic materials are used and disposed, all materials used in this sustainable relief housing , including construction and interior design , are biological nutrients that are naturally occurring and will harmlessly return to the earth and enrich the topsoil in Ethiopia after use. In the domed structure, earth-filled bags are used for both the walls and roof. This monolithic architecture minimizes types of materials used and simplifies the cradle to cradle material flow. Common earthbag construction materials that are not biological nutrients, such as polypropylene bags, plastic tubing and iron barbed wire, are not used in our design . Therefore, after use, the relief house can be torn down and all the construction materials will safely return to earth without depositing toxic or non-biodegradable materials. Besides basic construction, high value wooden components, such as doors and supporting beams, will be easily separated from the structure for reuse after the current structural user life. Locally available, non-toxic, hydrocarbon free burlap sacks measuring 43 cm by 76 cm are filled with local soils (6) from each of Ethiopia 's three climate zones. Local gravels are also used. Soil stabilizers are not necessary due to containment by the burlap bags. Local throne acacias plants (21), (22) are laid between bags as mortar, replacing the commonly used barbed wire (23). This substitution enhances the sustainability of the design by eliminating a non-biological nutrient. Papercrete plaster suggested by Hart (24) was made from study, soil and cement. In our design , plaster, made from 3 parts of dirt, 1 part of study and water as needed, serves as the exterior and interior finish and enhances the sustainability of the design by eliminating another non-biological nutrient, cement. Paper used in the plaster will be recycled paper. If necessary, soil from local termite mounds enriched with binding agents supplied by the termites may be added to the mixture, serving as a stabilizer for the plaster. Natural paints derived from plant and mineral materials are used for wall painting decoration. Natural adobe flooring, made from locally available flagstone with adobe mortar and sealed with naturally occurring linseed oil, is used for floor covering (6), (23). Energy use in structural design (use current solar income): The use of natural energy for heating, cooling and lighting is maximized throughout the design of the sustainable housing . One advantage of a domed structure over a rectilinear structure is that less energy is required to heat and cool a dome compared to a rectilinear home (6). Heating and cooling requirements vary for each of the three climate zones and the design includes varying combinations of the following techniques. The thermal flywheel effect (6), which is based on the idea that earthen walls function as an absorbent mass that is able to store warmth and re-radiate it back into the living space as the mass cools, is utilized and earthen walls 38 centimeters thick serve as thermal masses to negate thermal fluctuation. Surface color is dark in cooler areas in order to absorb heat and light in warmer areas in order to reflect heat (6). Space surrounding the structure is allotted for the planting of dense foliage in cooler areas and lighter foliage in warmer areas. Relief housing is recessed into the ground between 0.6 and 1.2 m in order to negate thermal fluctuation (25). By locating the doors and windows directly across from one another, ample cross ventilation patterns are created for cooling. Windscoops and overhangs are incorporated into the design as necessary in order to further facilitate air flow and block sunlight, respectively (25). Sunlight entering through many window openings in the house provides daytime lighting throughout the structure. Housing and interior design (celebrate diversity): Respecting cultural diversity is a top priority throughout this design . Considering geography, climate and the culture of Ethiopia , the relief housing has a common area, cultural area, family area and bedrooms. The relief housing was designed as a kit of parts, which may be assembled in various combinations as necessary based upon climatic conditions. The kit includes the following components: (1) large dome measuring 6 m in diameter, (2) medium dome measuring 5 m in diameter, (3) small dome measuring 4 m in diameter, (4) overhang system, (5) windscoop, (6) openings and (7) planting area. One example of a combination of these parts can be shown in Fig. 1 and 2. Table 2 shows the kit components and their uses followed by complementary discussion of the housing design . The use of a domed structure in this sustainable relief housing mimics the traditional Ethiopian tukul. Traditional arrangement of extended family structures facing an open area is maintained (15). Housing design is based on African fractals in keeping with tradition and the finished structures remain unpainted in order to accommodate the Ethiopian practice of building painting (26). Each structure accommodates up to twelve occupants with a minimum of 10 [m.sup.2] floor area allotted per person, in keeping with Ethiopian living practices and United Nations High Commission for Refugees (UNHCR) standards (27). Native furnishings are incorporated into the design . Structural stability, protection from moisture and precipitation, residential security and sanitation: Structural stability of sustainable relief housing is ensured through the use of multiple, interconnected domes rather than one large dome. A corbelling technique with a maximum overhang of 10 cm is used in conjunction with thorned branches. Compression rings are used around any vents at the top of the structure in order to counteract internal forces (6), while recessing the structure into the ground provides buttressing for external forces. A rubble trench foundation system is used in order to incorporate a capillary moisture break into the flooring system (6). Flooring is sealed with three coats of linseed oil, with soil from local termite mounds serving as a soil stabilizer for exposed soil mixtures (6), (23). Overhangs protect the structure from damage due to precipitation, while gutter systems sculpted from fidobe plaster channel water away from the structure (6), (23). Solid doors, complete with safety mechanisms, are used to ensure residential security. All windows must have a protective grate covering made from local materials and are located between 0.6 and 0.9 m above ground level. Plantings surround the structure are selected for their medicinal purposes, edibility and ability to be sold at high price. The local plants include Corindrium sativum, Croton macrostachyus, Euphorbia ampliphylla, Hagenia abyssinica, Lupinus albus, Olea africana, Ricinus communis, Tamarindus indica and Ximenia americana (28). Most of these plants grow to be fairly large, so they can also serve as a thermal regulation mechanism and a security device by making it difficult for people to reach the window. Second stories are implemented in domes over 2.4 m tall in order to create a smaller space and aid in emotional security. This space is used for children's bedrooms as needed in order to lessen the threat of violence against children prevalent in areas of resettlement due to urban migration (15). In order to assure sanitation, one biological toilet such as the SAWI Biocom[R] bark chip toilet is provided for each family and is located a minimum of 25 m from user housing (27). SAWI Biocom[R] bark chip toilet is a biological dry toilet that uses dried bark chips as a medium, giving odor-free waste storage and disposal is by compost. Durability evaluation: Fidobe plaster is used as the housing exterior to improve durability under conditions of intensive sunlight exposure. The Atlas SUNTEST Xenon Exposure System was used to test the sunlight resistance of fidobe plaster covered earthbags under simulated sunlight. The test also compared burlap bags and polypropylene bags. Since in Ethiopian culture, the housing exterior is re-plastered every year (12), our samples were exposed under Xenon light in SUNTEST with a time equivalent to one year sunlight exposure in Ethiopia . The test design and results are in Table 3. We have two replicates in the test and both tests have the same result. From Table 3, we can see that with or without plaster covering, burlap earthbags can withstand sunlight exposure in Ethiopia . Streamlined life cycle costing and analysis: Table 4 shows the initial and lifecycle material costs of sustainable relief housing . Lifecycle costs include replastering the exterior of the home yearly. In addition, with our innovative natural energy profile design for heating and cooling, the housing is very comfortable to live in with no additional energy cost. The relief housing is designed to balance all three aspects of sustainable development: environmental, economic and social welfare to benefit people, prosperity and the planet as shown in Table 5. The relief housing , designed with culturally acceptable structure, floor plan and interior, ensures social equality for Ethiopian people. Using biological nutrients in interior design and window openings for ample cross ventilation, indoor air quality will be significantly improved. Better indoor air quality, together with improved sanitation, addresses human health issues resulting from Ethiopia 's urbanization. 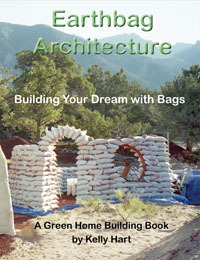 The construction of earthbag housing takes a significantly shorter time than other natural building techniques such as adobe (23). It is also easy to construct an earthbag housing as the skills needed to build a home are minimal and homes are often built by the homeowners themselves (24). Hunter and Kiffmeyer (6) made a conservative estimation of approximately one person making four bags per hour, including filling the bags, moving them into place, laying the wire between them, leveling them, tamping them, installing anchors and others. It was estimated that approximately 4,100 bags are needed to build the earthbag housing as shown in Fig. 1 and 2 to house about twelve people. Hunter and Kiffmeyer (6) also suggested that several teams of two workers are the most effective way to construct earthbag housing . It is assumed that among the twelve people who will live in the earthbag house, six adult people can work for the construction to form three teams of two people. Therefore, 24 bags can be made and laid for construction per hour by the three teams (6). If they work eight hours a day, three weeks (21 days) are needed for the construction. Considering other works such as plastering, interior design , painting and planting, about six weeks are needed to complete the whole earthbag house as illustrated in Fig. 1 and 2. As discussed, the design is modular and composed of a kit of components. For families with fewer people, a smaller house can be built within about the same time by fewer adult workers. With locally available materials, inexpensive construction, maintenance and use, this design provides affordable, comfortable and high quality shelter for Ethiopian people. The use of exterior plaster makes the structure more durable with minimum maintenance. A longer use period will further make the house more cost efficient and affordable to the Ethiopian people. With earthen walls functioning as an absorbent mass and natural energy profile design for heating, cooling and lighting, this house provides comfortable living at a low operation cost. By providing inexpensive housing for the people of Ethiopia , many additional issues besides shelter, such as food, health and environmental protection, can be addressed with saved monetary resources. The housing design minimizes environmental impact and addresses the issue of resource consumption. Since wood is only used for the second floor of the two large domes, one safety door and window openings, this housing design significantly reduces wood use compared with traditional Ethiopian residential construction. This will reduce housing 's environmental impact such as deforestation and desertification. After the relief housing 's useful life, the valuable wood and safety doors will be collected and reused. All other housing materials are natural and will return nutrients to nature after the home is torn down. After use, this housing has zero synthetic and toxin deposition, but instead enriches the soil in Ethiopia . In combining two techniques, earthbag construction and cradle to cradle design protocol, this relief housing design ensures the most effective use of material resources to provide affordable shelters for Ethiopian people, especially IDPs and achieves all three aspects of sustainable development: environmental, economic and social welfare. This study addresses the sustainability issues related to relief housing in a developing country, Ethiopia . However, the design and findings can also be applied in the developed world. Using locally available materials and inexpensive construction, the cradle to cradle earthbag technique can be used to build relief housing for citizens in developed countries such as victims of natural disasters like hurricanes, tornados and earthquakes. This publication was developed under a STAR Research Assistance Agreement No. SU832506 (P3 Award: A National Student Design Competition for Sustainability Focusing on People, Prosperity and the Planet) awarded by the US Environmental Protection Agency. (5.) Kennedy, J., 2002. Building with Earthbags. In: The Art of Natural Building, Kennedy, J.R., J.M. Smith and C. Wanck (Eds.). New Society Publishers, Gabriola Island, Canada, ISBN: 0865714339, pp: 149-153. (6.) Hunter, K. and D. Kiffmeyer, 2004. Earthbag Building: The Tools, Tricks and Techniques. 1st Edn., New Society Publishers, Gabriola Island, BC, Canada, ISBN: 0865715076. (8.) United Nations, 2005. World summit outcome. http://ec.europa.eu/comm/external_relations/un/docs/050915_un_summit.pdf. (12.) Ofcansky, T.P. and L. Berry, 2004. Ethiopia : A Country Study. 1st Edn., Kessinger Publishing, Whitefish, MT., ISBN: 1419118579. (18.) Teketay, D., M. Fetene and A. Abate, 2003. The State of Environment in Ethiopia : Past, Present and Future Prospects. In: Environment and Environmental Change in Ethiopia (Consultation Papers on Environment No. 1), Asfaw, G. (Ed.). Forum for Social Studies, Addis Ababa, pp: 11. (20.) McDonough, W. and M. Braungart, 2002. Cradle to Cradle: Remaking the Way We Make Things. 1st Edn., North Point Press, New York, USA., ISBN: 0865475873. (23.) Wojciechowska, P., 2001. Building with Earth: A Guide to Flexible-form Earthbag Construction. 1st Edn., Chelsea Green Publishing, White River Junction, VT., ISBN: 1890132810. (25.) Oliver, P., 2003. Dwellings. 1st Edn., Phaidon Press, New York, ISBN: 0714842028. (26.) Van Wyk, G., 1998. African Painted Houses: Basotho Dwellings of Southern Africa. 1st Edn., Harry N. Abrams Inc., New York, ISBN: 0810919907.